To create an activation concept that will tie in with the launch strategies of the new Abbott’s Village Bakery Fruit Loaf. The fruit loaf was toasted with butter and sampled to consumers to showcase the ideal way it should be consumed. 5iveSenses created Fruit Loaf Stand's to sample the product at prominent city locations in Sydney and Melbourne. The stands were designed around the 3 main ingredients in the Abbott’s product - apple, pear and apricot. Consumers queued for the classic toasted Fruit Loaf accompanied by freshly roasted coffee and the opportunity to sit down for a while within the giant Apple, Pear & Apricot stands. A total of 26,030 samples were distributed across 4 activation days. The sampling activity received an overwhelmingly positive response and attracted queues of consumers throughout the day. Sales exceeded the Bakery’s estimates and subsequent research tracked a very high sample to adoption rate. Overall the activation was experienced by 96,000 consumers. Team 5iveSenses completed a multi-platform Experiential Marketing campaign for Abbotts’ new product, “Fruit Loaf Bread”. 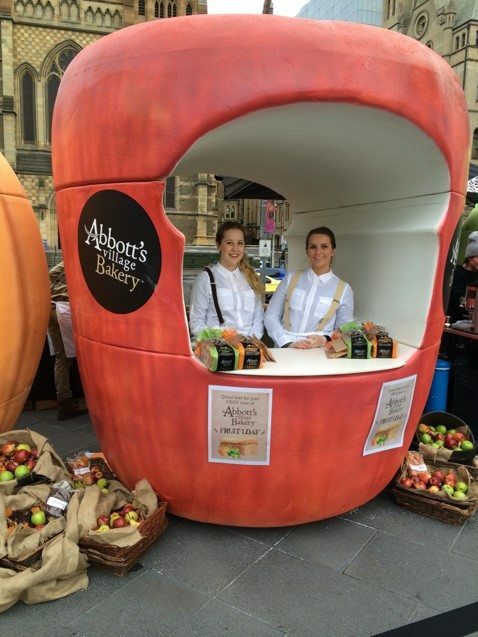 The team activated at prominent city locations in Sydney and Melbourne, with stands designed around the 3 main ingredients in the Abbott’s product – apple, pear and apricot. This brief article outlines an overview of the campaign including the challenge, solution and finally the results. The campaign was activated over 4 days during April 2014.